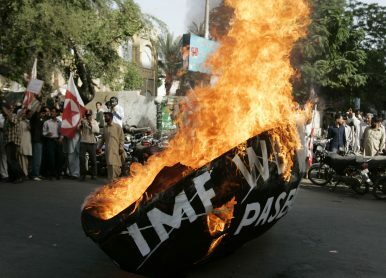 Activists of Pakistani religious party Jamat-i-Islami burn a symbolic large begging bowl during an anti-International Monetary Fund and World Bank protest in Karachi, Pakistan (April 16, 2009). With a Pakistan Tehreek-e-Insaf (PTI)-led National Assembly set to take the oath next week, following the party’s triumph in the July 25 election, the next government will inherit an economy facing multi-pronged crises. A minor recovery at the end of July notwithstanding, the Pakistani rupee has sunk by over 20 percent in the past seven months owing to a balance of payment quagmire. The rupee touched 130 against the U.S. dollar before election day, recovering to around 122 in the week after, as Beijing agreed to give Islamabad a $2 billion loan. During the previous calendar year the Pakistan stock exchange had gone from being Asia’s best performing market to the world’s worst. The stock exchange hit this year’s low point in July, two weeks before the elections. The last fiscal year ended with a current account deficit of $18 billion, 5.7 percent of the GDP. The budget deficit has crossed 2 trillion rupees. The government owes another trillion rupees in circular debt. Given the magnitude of these numbers, Pakistan has few options but to go to the International Monetary Fund (IMF) for another bailout package – the 13th for the country since the 1980s. Asad Umar, expected to be the next finance minister, has reiterated that the decision over the source of loans worth at least $12 billion will be taken within six weeks after he takes charge. “IMF is the only institution that gives a monetary program, not Asian Development Bank [ADB], Islamic Development Bank [IDB], China or Saudi Arabia,” economic theorist and political analyst Farrukh Saleem told The Diplomat. “With Rs4 trillion worth of T-bills set to expire in four months – and in need of a roll over – in addition to $8 billion worth of foreign debt servicing over the next 12 months, Pakistan will have to go for the IMF bailout,” he reiterated. Speaking to The Diplomat, former caretaker Finance Minister of Pakistan Salman Shah argued that not only is seeking an IMF bailout “the only option” for Pakistan, if implemented properly, it can fix a lot of economic problems in the country. “Even though we are getting [financial] support from China and Saudi Arabia, the IMF program is important for Pakistan, because it will help create the discipline that the country requires and will help govern the economic institutions in the country,” he said. In April, the then-advisor to the prime minister on finance and revenue, Miftah Ismail, went to the United States for meetings over countering terror financing. Reports had emerged that Ismail also met with IMF officials at the time to discuss conditions for a potential bailout. While Ismail has denied having any discussions related to a loan from the IMF while in the United States, speaking exclusively to The Diplomat, outgoing Finance Minister Rana Afzal Khan confirmed that talks had indeed been held. “The IMF sets certain monitoring conditions. With the IMF, our discussions were limited to what we had agreed with them and about the deviations we had to make because of the changing scenarios [over the previous year],” Khan said. “When [the then] PM Nawaz [Sharif] was removed, financial indicators in Pakistan changed, the perception of the developing economy changed, [and] the foreign companies went shy because they thought this country is going into another political crisis,” he added. Rana Afzal Khan also conceded that his predecessor Ishaq Dar’s policy of creating an artificial price of the rupee against the dollar, which hovered around the 100 mark for much of his tenure, was flawed. It is this artificial pricing that eventually saw a sudden nosedive in the rupee’s value. “The price of the currency depends on market sentiments, which in turn are linked to political sentiments. I had always felt the price between 115 and 120. So that’s where it is, but now it will depend on how the finance ministry manages it,” he said. While critics argue that the outgoing Pakistan Muslim League-Nawaz (PML-N) government could have gone to the IMF earlier to prevent the economic crisis in the first half of the ongoing year, Khan conceded it wasn’t politically feasible. “Yes, for political reasons we could not have gone to the IMF. But also, why should we book the next government for five years against their wishes? We have passed a budget to give a direction. Imagine if the PTI government also had the responsibility of drafting the budget; imagine the chaos it would have created,” the former finance minister said. With the ministry now eyeing the bailout, it is the conditions that IMF imposes that will be crucial for Pakistan. First of all, it’s expected that there will be a debt sustainability analysis under IMF instructions to determine whether Pakistan can sustain the loan. “It will be first such analysis carried out by the country,” said Farukh Saleem. “In addition to the debt sustainability analysis, and the usual demand to increase energy prices and taxes, the IMF is also likely to demand transparency for transactions related to the China-Pakistan Economic Corridor (CPEC),” Saleem believes. Pakistan’s balance of payment crisis stems from a rising trade deficit, which in turn results from rising imports, which touched a record $60.898 billion at the end of the previous fiscal year. “China is playing a huge role in Pakistan’s trade deficit – Pakistan’s imports from China are significantly higher compared to its exports to the country – which is one reason why Pakistan has been trying to revise its free trade agreement with China,” said Salman Shah. It is Islamabad’s reliance on Beijing, and the CPEC inflow, which prompted U.S. Secretary of State Mike Pompeo to issue a warning to the IMF against a bailout package that could aid China. “There’s no rationale for IMF tax dollars, and associated with that American dollars that are part of the IMF funding, for those to go to bail out Chinese bondholders or China itself,” Pompeo said. Salman Shah believes that Pompeo has “embarrassed” the IMF. While Shah doesn’t think the IMF would set any conditions that could bar Pakistan from trading with China, he concedes that a “diplomatic predicament” has been created. A relationship previously specific in scope has expanded beyond closed diplomatic corridors, bringing new challenges.